Carrie Jenkins is leading Centra Credit Union on a new journey into predictive analytics powered by a new core processing system and data warehouse solution. 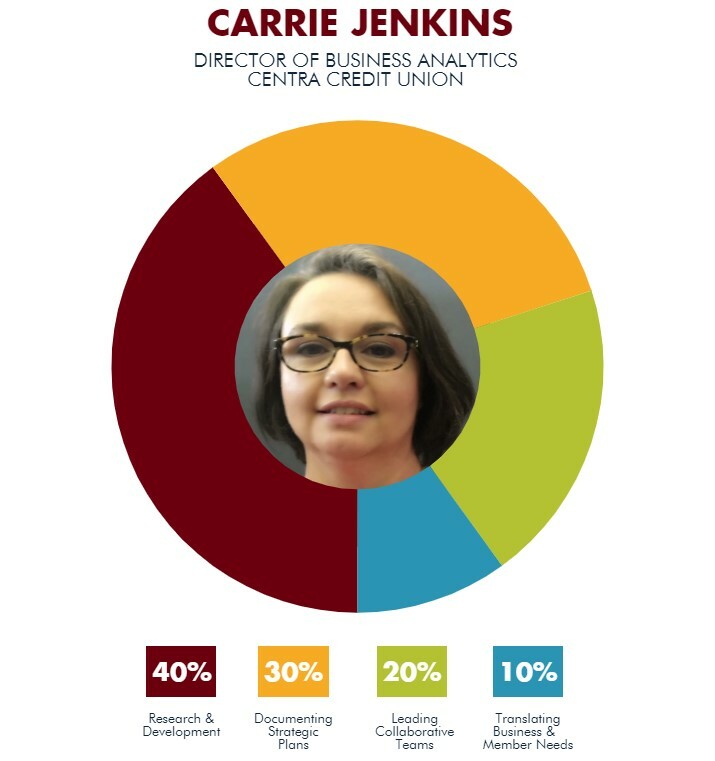 Data analytics is top-of-mind across credit union land, and Carrie Jenkins is looking forward to pushing it forward at Centra Credit Union ($1.5B, Columbus, IN). Jenkins is the Indiana credit union’s first director of business analytics. She joined Centra in February 2017 to lead a team responsible for empowering Centra’s decision-makers with a new world of actionable insight. She’s got plenty of tools to work with and more on the way. The credit union has just completed a core platform conversion and is deploying a new data warehouse. Her team members are helping the enterprise understand the capabilities of its new core data processing system and looking forward to creating new dashboards and reporting tools to tap into the emerging power of predictive analytics. Here, Jenkins — who has 20 years of enterprise data experience — describes where her credit union has been and what she hopes to help Centra achieve as it embarks on its data analytics journey. Why did Centra Credit Union create this department and role? Carrie Jenkins: Prior to forming the business analytics department, Centra’s use of data and reporting was reactive and limited. Our leadership recognized the need to centralize reporting and analytics. What qualifications made you a great fit for this job? As soon as the data warehouse is in place, we get to start the real analytics journey! The data geek in me is so excited. CJ: I’ve worked in this type of role since the early ’90s in several different industries and locations. Most of my knowledge and skills come from practical experience. That helps me see the development of Centra’s analytics department from the end user side and the technical side. CJ: I report to the vice president of finance. My team includes a reporting analyst and member research analyst. CJ: We’re the keepers of data. All reports and data analysis come through us. Right now, I’m responsible for general reporting, data governance, data warehouse implementation, dashboard creation, and predictive analytics. CJ: I wish I had a daily routine. We’ve just gone through a core conversion and we’re trying to find the new normal. To complicate my routine even more, we’re just about to adopt a new data warehouse solution. My team won’t see “normal” for the rest of the year. Right now, we’re winding down the process of making sure everyone has access to the information they need to do their daily routines. As soon as the data warehouse is in place, we get to start the real analytics journey. The data geek in me is so excited. Find your next partner in Callahan’s online Buyer's Guide. Browse hundreds of supplier profiles by name, keyword, or service area. What visualization tools and other software do you use? What vendor is providing Centra’s data warehouse? CJ: Our business analytics team has been spending so much time on data cleanup that we haven’t gotten to do much visualization. We’re fledgling Tableau users who are looking forward to the day when our data sources are easily accessible and all in one spot. We are working with OnApproach to develop that spot. The OnApproach M360 solution will allow us to integrate our data sources into a single source of truth. The first phase will integrate our core data from DNA. We have several stand-alone data sources — to include our loan origination, collections, and general ledger systems — we hope to integrate into M360 at some point. How do you track success in your job? CJ: After the core conversion, I’ve measured success by the length of my to-do list. My main focus has been to make sure everyone has the information they need to do their daily jobs. My team tried to prepare as much as we could with the test data in the new core system, but that was a drop in the bucket of what was actually needed. I have goals for set 2019 around dashboard creation and predictive analytics. Those are the goals that will determine the true success of the business analytics department. And that success comes in the form of cost savings and membership retention and growth. How do you stay current with topics that fall under your role? CJ: In the beginning, I attended every webinar I could find from Callahan, Fiserv, Tableau, Experian, etc. I enjoy learning about what other credit unions are doing to use the tremendous amount of data they collect in the course of doing business. Now that my to-do list is getting shorter, I can jump back into the industry articles and webinars. Job titles say as much about the organization as they do the person. Have you seen a title you’d like to know more about? Let editor Rebecca Wessler know at rwessler@creditunions.com or (202) 223-3920, ext. 503. Does your team have access to all the industry data they need to make data-backed decisions that put your members first? Learn more about Callahan's suite of industry performance data and how we can help move your cooperative forward.